"Let's start off with the introduction of the Holy Spirit. It's found right in the first chapter of Genesis in the second verse: "The earth was without form and void; and darkness was on the face of the deep, and the Spirit of God was hovering over the face of the waters. Then God said, 'Let there be light;' and there was light.”At the very beginning of Genesis, you have God's Word, Jesus; you have God the Father; and you have the Holy Spirit: the Trinity all represented in creation. Let's take this into the New Testament because we have almost the same thing where Jesus is talking about the Holy Spirit. He says," That which is born of the flesh is flesh, and that which is born of the Spirit is spirit. Do not marvel that I said to you, 'You must be born again.' The wind blows where it wishes, and you hear the sound of it, but cannot tell where it comes from and where it goes. So is everyone who is born of the Spirit" (John 3:608, NKJV). Jesus is talking about the Holy Spirit, and He's saying it is like wind. When you get into the Greek behind that, the Greek word is pneuma, which again means"A current of air," "Breath," or a"breeze," and again by analogy," a spirit.”So both the Hebrew and the Greek word are talking about breath. It's talking about wind. Back in Creation, back in Genesis, you've got how we were made.”And the Lord God formed man of the dust of the ground, and breathed into his nostrils the breath of life; and man became a living being" (Genesis 2:6-7, NKJV). Some translations call that"A living soul.”It's from the breath of God that we actually get our life. And so now you get the linkage of how we were created. How we were created in the image of God is because of our breath, and it is because of the breath of God coming into us. The same thing happens when we are born of the Spirit. When we are re-born, it is from the breath of God. "Occasionally the Divine Cool Breeze blows around the Templum Spiritus Sanctus of the Great Adi Shakti. The Kingdom of Sadashiva is saturated with this Divine Wind which permeates the bodies of all the Immortal Ones meditating on Her in the Thousand-Petal Lotus. This Divine Cool Breeze of the Holy Ghost used to buffet the spiritual body of Kash into a divine ecstasy of Nirvikalpa Samadhi devoid of all thoughts or duality. The family members thought that only he was able to experience this phenomenon due to his extraordinary spiritual awareness. About three years later"suddenly there came a sound from heaven, as of a rushing mighty wind, and it filled the whole house where they were sitting.” (Acts 2:2) This astonishing Wind of the Holy Spirit was felt for the first time by Kash's parents. It was an amazing experience to feel gusts of Wind swirling all around, the surest Divine Sign that the Resurrection is taking place! This Cool Breeze is not the natural draught experienced by human beings but a spiritual manifestation. No pieces of paper are lifted up or clouds of dust produced, but it is there to assure that they are experiencing precisely the manifestations of those born of the Spirit, and one of the Sure Signs of Resurrection that the Bible and Qur'n promised! (This Wind is similar to that daily flowing out of the hands, heads and other parts of the body, but just more intense. Can he enter the second time into his mother's womb, and be born? Marvel not that I said unto thee: Ye must be born again. It is written both in the Qur'n and Bible that during Qiyamah (Resurrection) those who get their Self-Realization will have Cool Breeze or Wind coming out of their hands, head and other parts of the body. The"hands will speak"to inform the individual of any wrong- doing on a particular finger(s) which correspond to certain problems. This experience is part and parcel of the human subtle system which is activated after the Baptism of Allah (Self-Realization). Prophet Jesus also preached that those born again of the Spirit will experience the Wind, but will have no idea where it comes from or goes, i.e., this is not the normal wind which humans daily experience but a Divine Wind from within. “So when the Kundalini ascends through the central path — you see the subject is so great that even if I give thousand lectures I cannot cover it, so the thing is I'll try to cover every point little bit here and there. When the Kundalini ascends, I told you the Cool Breeze starts coming out of your head. So what happens to you? For the first time you feel the Cool Breeze of the Holy Ghost!" "Even if you get the glimpses of your Realization you have to at least believe that you are also the Spirit. You go on sticking to that experience and keeping your attention on the fact that you are the Spirit. Tell your intellect not to cheat you anymore. You can turn the face of your intellect by this. Now your intellect will start working for the pursuit of the Spirit. This is what faith means. Faith gives rise to pure intelligence. Krita Yuga means at the Time when this All-Pervading Power has started acting. Nobody felt the cool vibrations! Can you believe that? They felt the cool but not the vibrations. It was never related to any science. It was never related to physical science especially. 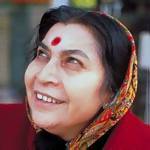 So I must say the achievement of Sahaja Yoga is tremendous ... The All-Pervading Power has started acting as I am on this Earth!"